If Europe is on your list of places to explore, but you are worried you can’t afford it, a visit to Crete just might change your mind. Though not quite as inexpensive as parts of Southeast Asia and Latin America, Crete’s cost of living is not that far off those Southern Hemisphere options. The other notable benefit is that a property purchase of 250,000 euros or more qualifies you for a residency visa. More on that in a moment. Last week, I introduced you to the city of Chania on the northern coast of western Crete. This week we continue our exploration of the northern coastline with a look at the Akrotiri Peninsula, a head-shaped outcrop of land to the northeast of Chania. Greece’s shaky economy may make you wonder if it’s a place that should be on your radar. Greece has suffered considerably since the global economic crisis, and this month was declared officially in recession again. However, the European Commission says that it expects Greece’s GDP to “bounce back” to 2.6%, with the planned injection of cash from EU creditors. As a potential property buyer with dollars, recession is mostly good news for you—though sad for Cretans. That positive feeling, despite recession, is possibly a result of visitor numbers. Crete is a very popular living and vacation destination for many nationalities. An estimated 18,000 foreign nationals live here (out of a total population of about 624,000). According to 2014 data from the Greek Research Center for Tourism, Crete attracts one in five tourists going to Greece. More recent figures from the Hellenic Civil Aviation Authority show that Crete’s two international airports (at Chania and Heraklion) had—along with Athens, Thessaloniki, and Rhodes—the greatest increase in passenger traffic from January to April 2017, compared with the same period last year. Why do all the visitors come? The Mediterranean climate is a huge draw, and climatic extremes are unheard of. The annual average ranges from 14⁰C to 28⁰C (57⁰F to 82⁰F), though it does snow up on the White Mountains and summer months can regularly see temperatures up to the mid-30⁰s Celsius (95⁰F). Winters are typically mild (about 13⁰C/55⁰F), wet, and sometimes blustery. Overall there are about 300 days of sunshine a year. 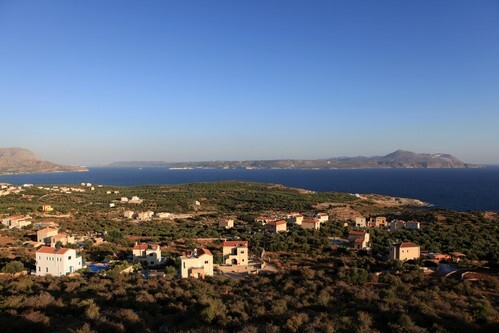 Other major benefits of living on Crete are the cost of living and the price of property—both are low. I estimate a couple could live on a penny-pincher’s budget, renting in Chania town, for just under 800 euros a month. Alternatively, 2,000 euros per month would provide a very comfortable standard of living. And it’s possible to buy a modern condo in a quiet Cretan village for 120,000 euros (about US$135,000 as of this writing), including white goods and a shared swimming pool. I’ll offer some specific examples of properties currently on the market in a minute. Here’s the reason why Crete might be particularly attractive to you if you’re a non-EU citizen but interested in living in Europe: Greece, and therefore Crete, offers non-European citizens the opportunity to buy property and in return qualify for a permanent residency visa. The minimum qualifying property value is 250,000 euros, which can be invested in one property or several. Or you can buy a property for less than 250,000 and then spend the remaining qualifying amount refurbishing or redeveloping it. The purchase provides residency for you and your spouse and dependents (children up to 21 years old). You do not have to live in Crete to maintain the residency status, and you can rent your property out once all the paperwork is finalized. The visa also gives full access to the Schengen Area. The Schengen Area includes most but not all European Union countries. For example, it does not include not Bulgaria, Croatia, Cyprus, Ireland, Romania, and the United Kingdom despite those countries being part of the EU. Additionally, the Schengen Area includes some non-EU countries—Iceland, Norway, Switzerland, Liechtenstein. One of this visa’s few restrictions is that you may not work in Greece. So What’s The Akrotiri Peninsula Like? It took me just 35 minutes from the bus station in Chania city, on a modern, air-conditioned bus, to travel to Stavros, a village on the far northwest of the peninsula (where “Zorba the Greek” was filmed). Leaving Chania, the ride winds up a steep hill through residential areas and then up on to a plane, where you have a great view down to Souda Bay to the south and east (the location of Crete’s main port, NATO training base, and the Hellenic Navy) and Chania town to the west. The land is rolling, covered in olive groves, vines, and great bushes of flowering mimosa, with tiny little bays and beaches around every twist in the road. Parts are scrubby and dry, though, so don’t expect lush greenery everywhere. 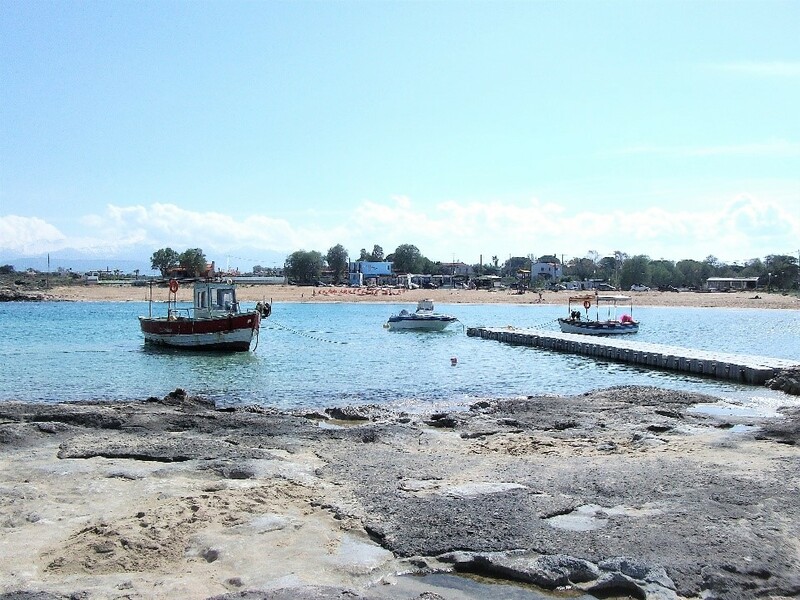 The peninsula’s main town is Kounoupidiana (population about 8,600), where the Technical University of Crete is located. Mostly the area’s population lives in small villages and individual developments, some multi-property, newly built, and sharing facilities, others ancient and basic with chickens scratching about in the yard. To give you an idea of what’s available, I’ve chosen a range of properties from total renovation to ready-to-move-in and at various prices. I couldn’t find many renovation projects, probably because not very much was built here in times gone by. I found a three-bedroom, detached, 95-square-meter (1,022-square-foot) single-story bungalow on a 3,000-square-meter (3,500-square-yard) plot of land built in 1978 and in need of total renovation. It sits in a quiet residential area among other villas, a 10-minute drive from Kounoupidiana. Listed at 109,000 euros. Next, I found an attractively renovated two-bedroom, two-story, 68-square-meter (732-square-foot) stone house on a 150-square-meter (1,615-square-foot) plot on the outskirts of tiny Kalathas village. The property is sold with appliances and possibly other furniture. It has a small private terrace, shared gardens with other attached neighbors, and a roof terrace with sea views. Kalathas beach is about 1 km away. Listed at 130,000 euros. Located in the village of Chorafakia, about 1.5 kms from the previous property in Kalathas, is a two-bedroom, two-bathroom, 67-square-meter (721-square-foot), fully furnished, condo-style property that lacks character but might make a good part-year home or vacation rental. It’s part of a complex of six properties with a shared pool, with beaches at Kalathas and Tersanas a 5-minute drive away. The property is being sold with all electrical goods. Listed at 120,000 euros. More spacious than the previous property and more than double the price, this three-bedroom, two-bathroom, modern, condo-style property is a short walk from the center of Kounoupidiana. It has 140 square meters (1,507 square feet) of living space and an 80-square-meter (861-square-foot) basement. This property is part of a complex that shares a large swimming pool. Sold with heating, air conditioning, fireplace, and oak floors. Listed for 250,000 euros. Increasing the budget to 495,000 euros opens the portfolio of properties up to include some high-end developments, including this 200-square-meter (2,152-square-foot) villa with four en-suite double bedrooms. The villa is part of a four-property complex in the tiny hamlet of Tersanas (with one taverna), overlooking the bay and beach. Each has a private garden, swimming pool, garden area with lawn, and extensive sundeck area and shares a tennis court. Sold with all appliances, wardrobes, fireplace, solar heating, air conditioner, and more. So there you have six properties that could provide a home, an investment, and the vehicle for an EU residency permit on an island that’s easy to access, has fascinating ancient and natural history, and provides a good quality of living at a low price.